Telltale Games put Sam & Max on hold for a little while there, tending to the needs of Monkey Island fans the world over. Now that series is done, however, it's back to the dog & rabbit show. A new site has popped up over on Telltale's domain, teased at the conclusion of the fifth and final Monkey Island episode. 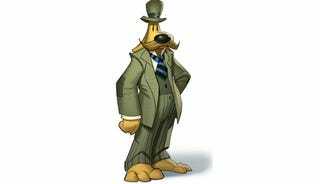 It's got Sam, Max and a prominent 2010 all over it, along with some concept art showing a heavy dose of sci-fi and just a hint of time travel, given Sam's rather dapper attire. In addition to the visual clues, there's also some audio playing over the art, suggesting that Telltale's next Sam & Max may not be your average point-and-click adventure game, instead featuring gameplay where you're given a lot more direct control over events.